Back in January 2015 I started a blog post series entitled “The Disappearing Market”. At the time I was surprised that there were any condos near downtown Seattle selling for less than $150,000. I was thinking about the San Francisco and New York real estate markets and wondering how long ago that price range vanished from existence in those markets. 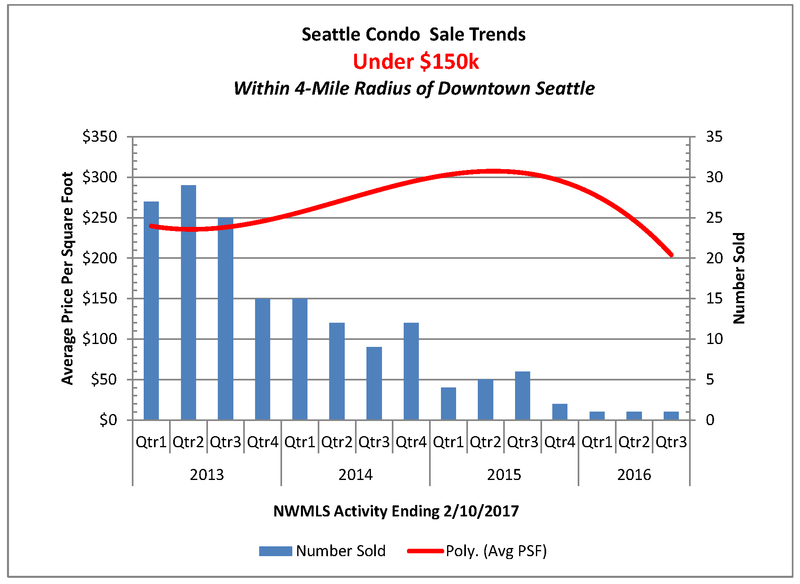 Sure enough, when I revisited the topic in February 2016 sales of condos priced under $150,000 were practically non-existent. (As you can see by the graphs, by 2016 only one to two condos in this range were selling each quarter.) The last condo priced under $150,000 sold in Q3 2016. I speculated in that second blog that the same fate laid ahead for condos priced under $200,000. 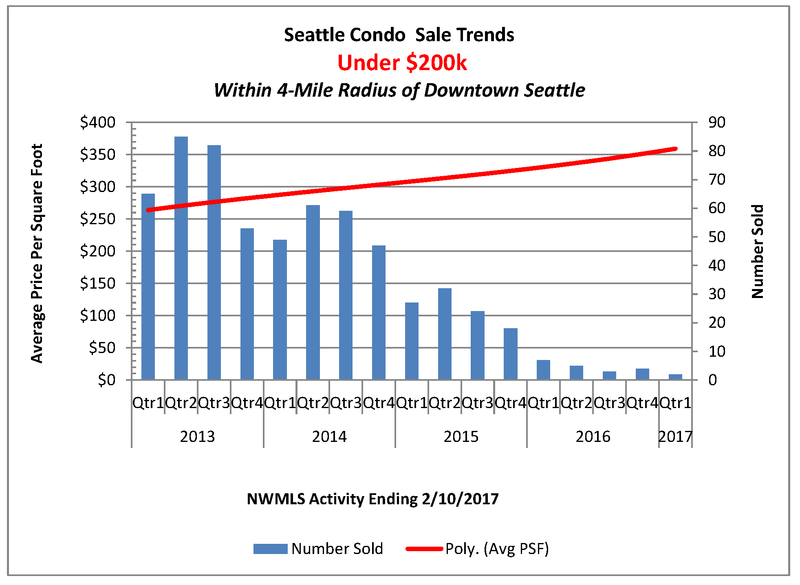 Well here we are in early 2017 and I believe we are witnessing the last gasps of the “Under-$200k” condo market within a 4-mile radius of downtown. (The epicenter was set at 3rd & University; only because that’s where my eye visually estimated the center of downtown. Nothing too scientific going on there. The 4-mile radius extends to the communities Magnolia, Fremont, & University District, Capitol Hill, and West Seattle.) The final days of this market segment look remarkably similar to the demise of the Under-$150k Market. As we moved our gaze to the “Under-$250k” Condo market it is not hard to see what is coming next. 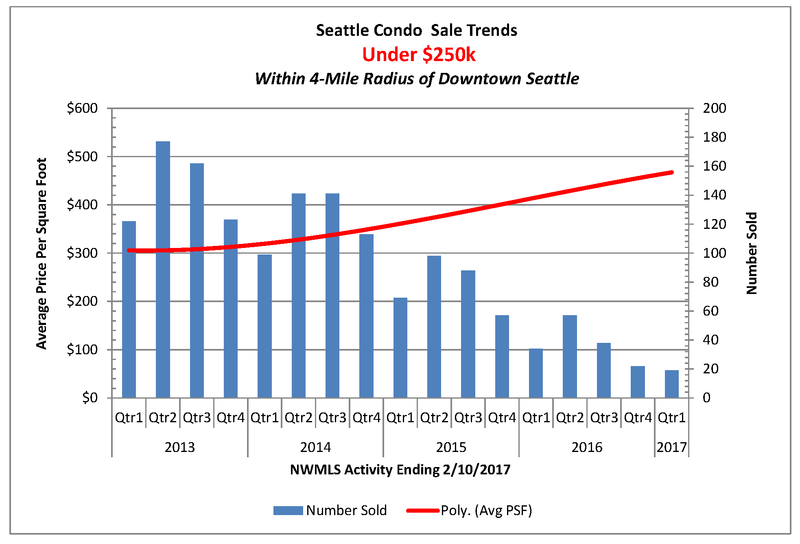 As long as the supply of condo listings remains at historic lows, we will be mourning the loss of this market segment too in 2017. Anyone who bought a condo priced under $150,000 in 2015 could easily resell their unit today for over $200,000 and realize a profit in excess of 33%. If they hold on for another year, they could likely sell for over $250,000 for a 66% profit. Not a bad investment by any standards. If you’re thinking, “Yeah, I get it. I missed that one, but that won’t happen again…” To you I would say “LOOK AGAIN”. The lesson here is that the greatest appreciation in value is occurring at the lowest end of the market, not the upper end. Higher land and construction costs guarantee that low-priced condos are not going to be built anytime in the foreseeable future. The low-end of the condominium market is truly “The Disappearing Market” and your opportunity to take advantage of it is now. Starting right now, I will be Tweeting out whenever a condo priced under $200,000 comes on the market. 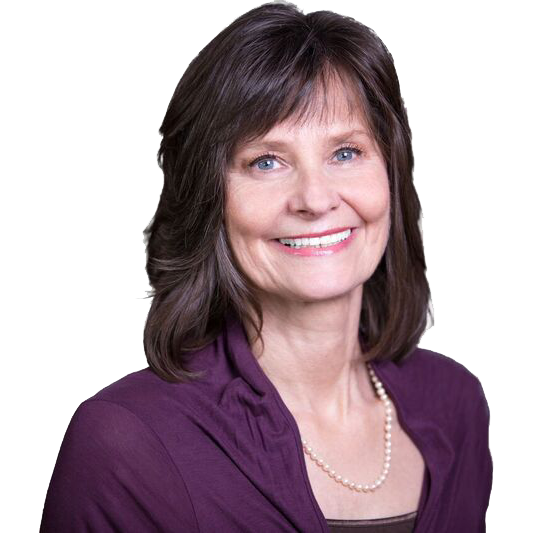 Click on the Twitter icon on my website if you want to follow my tweets.